Businesses have come together. Research has been compiled. Organizations have marching orders. What will San Diego do in order to project its competitiveness and ensure the entire world knows San Diego is the place to live and work? For starters, we’ll make sure people can get to and from the region. San Diego International Airport (SAN) is one of the region’s premier vehicles lifting the region’s profile and connecting its businesses and people to the globe. With flights to more than eight nonstop international destinations, such as Tokyo through Japan Airlines (JAL) and London through British Airways, San Diego businesses have access to virtually any market around the globe. The airport has been strategic about its global work. It’s no coincidence that San Diego’s two largest sources of foreign direct investment* are Japan and England, also the location of the region’s two direct intercontinental flights. How else does the airport increase the region’s global profile and competitiveness? 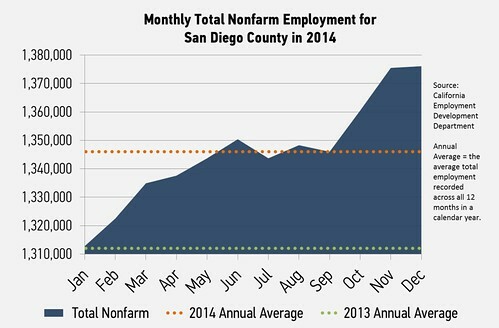 In 2012 alone, San Diego International Airport created $9.2 billion in annual economic activity and supported nearly 89,750 jobs in the San Diego region. Additionally, SAN served a record 18.7 million passengers during 2014, the highest total seen since 2007. The airport is a travelers’ first impression of the region as well as their last thoughts. With the newly-completed Terminal 2 “Green Build” expansion, travelers coming through the airport experience the best San Diego has to offer. When your regional airport includes one of the nation's fastest growing breweries and is infused with local cuisine, visitors coming to San Diego understand why so many people want to work and live in the metro region. As the U.S.’ closest major airport to a downtown urban core, it makes sense that innovative technologies and solutions easily permeate into the daily activity at SAN. As the busiest single runway in the U.S., San Diego has adapted and implemented new and innovative technologies to improve efficiency and ensure reliability as planes arrive and depart from the airport. In 2012, JAL was the first airline to debut the sleek, innovative 787 Dreamliner aircraft. 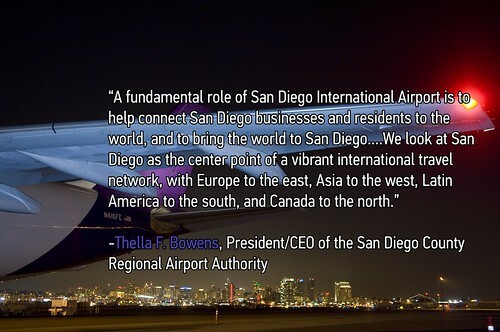 At San Diego’s Global Summit on March 11, Thella Bowens, president/CEO of the San Diego County Regional Airport Authority, will join other community leaders to discuss San Diego’s ability to compete on the global runway. Next week: San Diego is not only home to one of the best universities in the nation, but one of the top 20 universities in the world. So how do we leverage these strengths of having one of the world’s most innovative universities in our global competitiveness plan? More on that, next week. 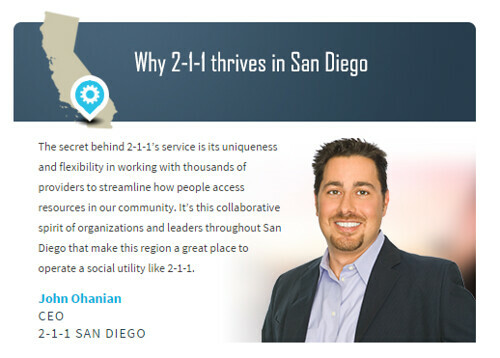 With new and stable city leadership, sustained recovery from the Great Recession, and a balanced city budget, San Diego is poised for future and sustained growth. San Diego’s ability to maintain long-term economic growth and job creation will depend on its ability to attract additional investment and promote exports in the region’s key industries. Have no fear; San Diego’s leaders are prepared to do just that. 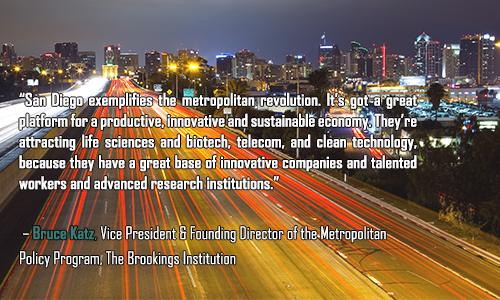 San Diego’s participation in the Global Cities Initiative (GCI) began in 2012 when the Brookings Institution selected San Diego as one of eight metro areas to participate in the Metropolitan Export Exchange program whose goal is to help regional leaders create and implement strategic action plans to increase exports. This effort culminated locally in the release of the Global San Diego Export Plan in early 2014 and the formation of the Global Competitiveness Council to champion international efforts. The initial plan revealed some stark facts about San Diego’s position in the global economy. San Diego is the 17th largest metro by GDP and population in the U.S. but it ranks 49th in the US in terms of the percentage of jobs in foreign-owned firms and 61st in terms of export intensity. However, it also gave us an opportunity to change things. Immediately following the release of the Export Plan, San Diego was selected as one of six cities to participate in a new pilot GCI program, the Metropolitan Foreign Investment Initiative. What started as a program focusing on educating leaders about the benefits of foreign direct investment (FDI) and helping regions create policies and programs to attract additional FDI evolved into cities actually creating a global trade and investment plan – which marries the action plans of increasing exports and attracting FDI. Foreign direct investment may seem like an elusive term, but it can be defined as when a foreign entity invests in a domestic organization either by locating part of its business here or by infusing capital or buying a domestic business. 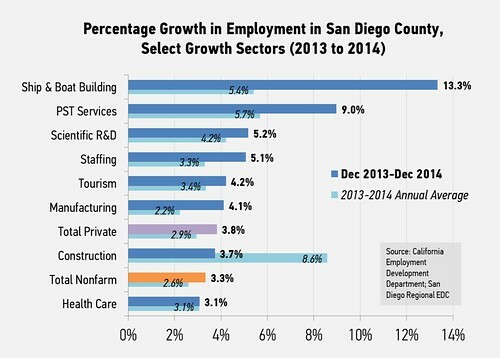 The benefits of increasing exports and attracting FDI are key to San Diego’s future and sustained growth. 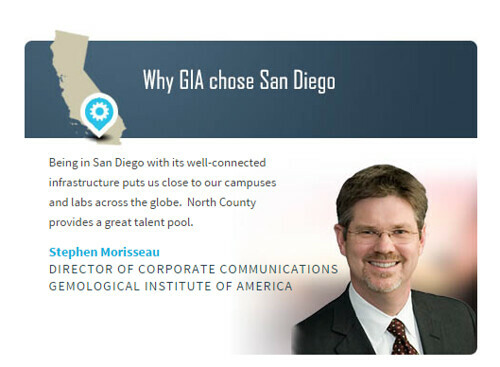 Global companies – those that export or receive foreign direct investment – pay their employees higher wages, invest more in R&D, and increase the global exchange of ideas; all important and relevant if San Diego wants to compete in the international marketplace. 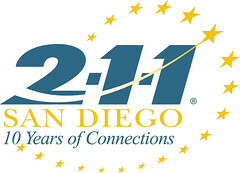 At San Diego’s Global Summit on March 11, EDC and its partners will release the region’s Global Trade and Investment Plan, a culmination of research, action plans, and programs which aim to increase the amount of foreign investment into the region and assist companies in the region in their effort to go global. 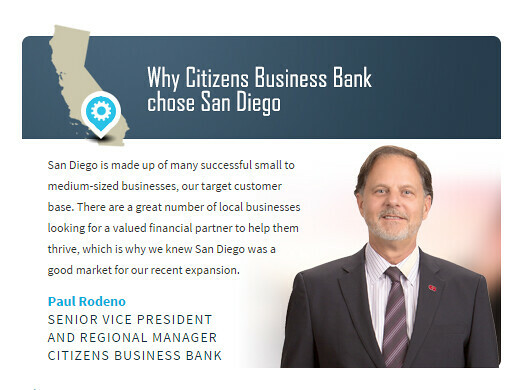 Next week, we’ll take a look at a regional asset that contributes more than $10 billion in economic activity and connects San Diego’s businesses and people to the globe. 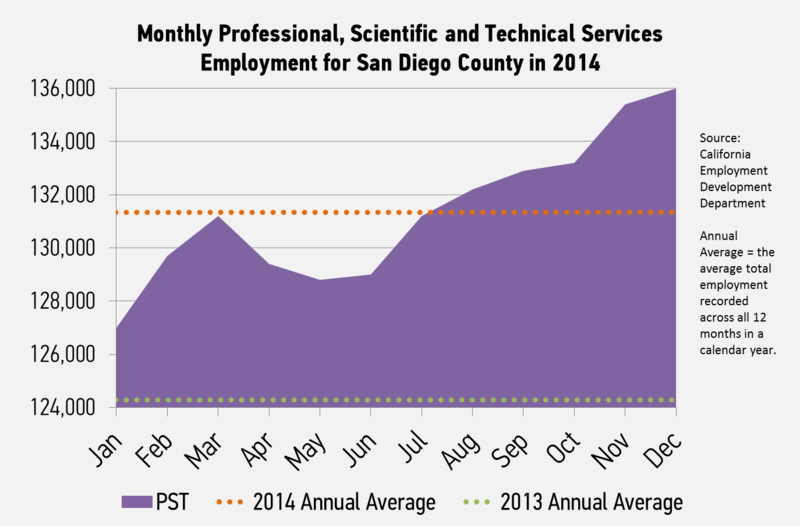 In regards to San Diego’s position in the global economy, there’s no place to go but up. 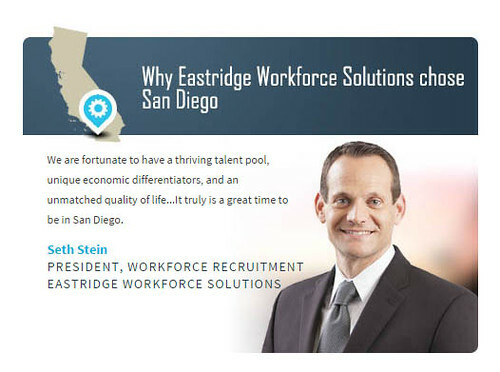 From the success of National Manufacturing Day to Nat Geo's decision to profile San Diego in its 'World Smart Cities" documentary, to efforts to defend the region's military assets, EDC worked with its partners to ensure San Diego continues to be a magnet for talent, capital and investment. Please check out our infographic displaying all these 2014 accomplishments. 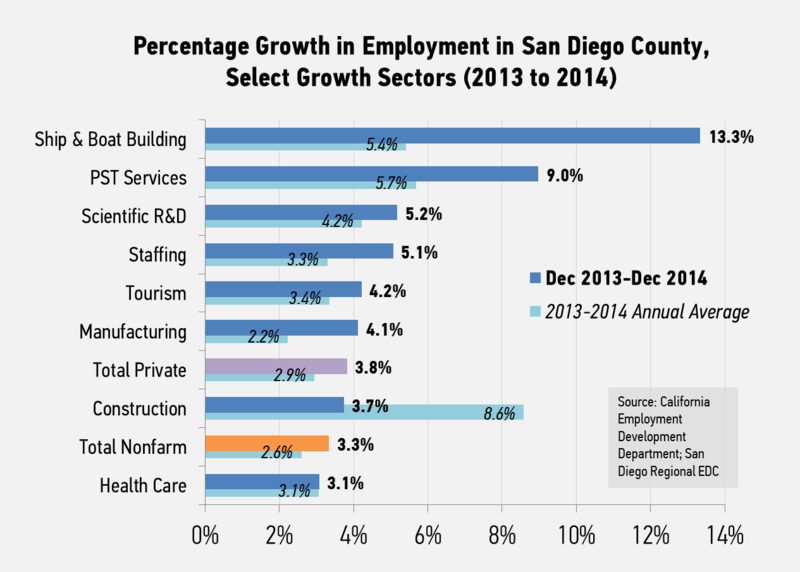 Every quarter, San Diego Regional EDC analyzes key economic metrics that are important to understanding the regional economy and San Diego’s standing relative to other major metropolitan areas in the U.S. This issue covers data from the July 2014 to October 2014 quarter. 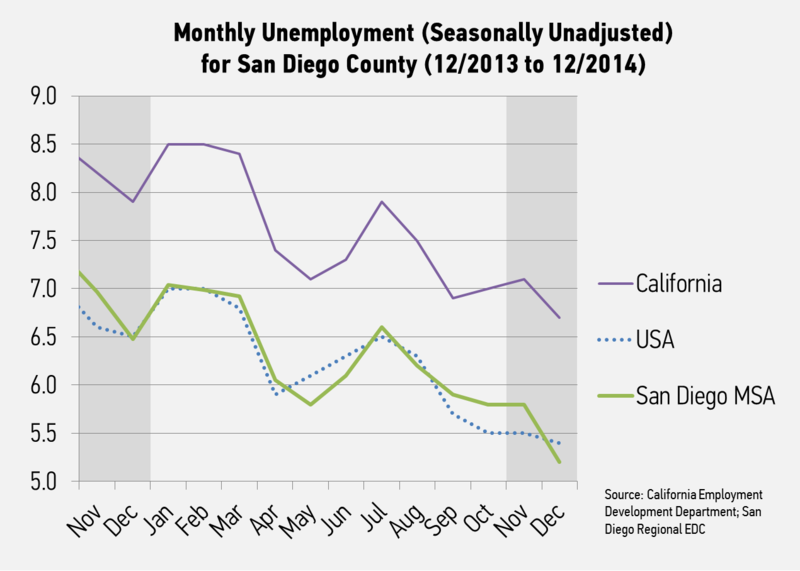 In this issue, EDC presents updates on trends in employment, real estate and venture capital, with a special spotlight on the labor market in 2014. The spotlight provides an analysis of employment, unemployment and key sectors using annual 2014 employment data. Download the full snapshot to view all of the tables, graphs and trends for this quarter.